Right, that's pretty much it from us. If you are still hungry for more on Sunderland's win at Crystal Palace then have a look at Saj Chowdhury's match report here. The Champions League swings back into action tomorrow. Make sure you join us then. Cheerio. "Defensively we were sound. Rarely troubled in front of the opposition goal. Today we frustrated the crowd, we frustrated Palace and then we came out with a fantastic win and our first away win of the season. "With Defoe and Fletcher up front, if we get an opportunity we will score. When you persevere you take advantage [of a mistake] and it is an important three points for us. "We are trying to build confidence and the only way you do that is get points on the board. When the Sunderland fans wake up tomorrow that is what they will see and we are all very happy. "Taking full advantage of what you get will get you out of the position we are in." A good day for Sam Allardyce as he picks up his second win as Sunderland boss. A bit more from Sam Allardyce, speaking about goalscorer Jermain Defoe: "He is a classy finisher. If you want somebody to chase down what looks a lost cause [it is him]. Defoe not giving up is why the defender and the goalkeeper messed up. "We have a little more hope but we have to strive to have as many points as games we have played. Once we have that we have to kick on." Sunderland boss Sam Allardyce, speaking to BBC Sport: "It has been a great result today. A very resilient performance, our first away win and our second clean sheet. It is a very valuable win for us. "We have been conceding three goals a game on average and that has to stop. Digging our way out of this position is about being resilient." Crystal Palace boss Alan Pardew: "We got a lot of the ball, a lot of possession, unfortunately we could not create a sweet moment tonight and things went the wrong way for us. It happens in football, you make a mistake and they capitalise and get the win. "I think Scott Dann tried to take Defoe and edge him out but Defoe checked his run and got on the other side of him. Dann has been magnificent for us, we will have to pick ourselves up for Saturday. "This was different to the Liverpool game, the emphasis was on us tonight. It was about trying to get that cross on the money, but our crossing and final pass I felt let us down. It was a simplistic game they played but they did it well." Jermain Defoe, speaking to Sky Sports: "The lads worked hard. We put the work in during the international break and it paid off. "I got that little bit of luck that you need for the goal and I was just delighted. "The manager has been fantastic. He has got the lads working hard." Credit to Sam Allardyce, he could have played it safe and gone for the draw but he gambled with attacking substitutions and it paid off. That's it! A big win for Sunderland and Sam Allardyce as the Black Cats move to within a point of safety. ...Yohan Cabaye's free-kick is around the wall...and into the sidenetting! Quote Message: Forget the scoreline - have a look at the Sunderland performance. Does that encourage you for the road ahead? It certainly does. Forget the scoreline - have a look at the Sunderland performance. Does that encourage you for the road ahead? It certainly does. A rare Sunderland attack in these final minutes as Duncan Watmore gets the ball in midfield and lurches forward. A tackle comes in but Sunderland regain possession and Jeremain Lens heads towards the corner flag, drawing a foul from a Palace defender and the visitors have a free-kick. Another Palace attack, another Palace corner. Yohan Cabaye whips the ball in and Costel Pantilimon is again out to punch away. Not far enough though and he is down on the ground, the ball could be anyones but the whistle goes for an infringement. Sunderland are surviving for now. A roar of encouragement from the Palace fans as five minutes of added time are shown on the fourth official's board. Patrick Bamford rolls the ball into the path of James McArthur, he's unmarked on the edge of the area and shoots...weak. Palace fans groan as Costel Pantilimon scoops up the ball. Thoughts on tonight's match? Get involved on the Radio 5 live football social after full-time. You can call 0500 909 693, or text 85058. Phone lines are open now. ...Yohan Cabaye takes the free-kick but Costel Pantilimon strides off his line to punch away. Palace regain possession, and then win a corner, which comes to nothing. Alan Pardew will be fuming with his side's set-pieces tonight. Goalscorer Jermain Defoe is injured. He hobbles off and Sam Allardyce makes a change. A defensive one to protect the lead? No, on comes striker Danny Graham. That's woken Palace up though as they go straight on the attack and Yohan Cabaye forces a one-handed save from Costel Pantilimon. A big seven minutes coming up for both sides now. Can Sunderland hold on to a precious win? Quote Message: Dann did not deal with it, he let the ball run instead of dealing with it. Defoe got the wrong side of Dann, who made the tackle and pushed the ball past his own keeper. Don’t start trying to be clever, Dann could not have made it any easier for Defoe. He should have done the easy thing - cleared the ball away when he had a chance. Dann did not deal with it, he let the ball run instead of dealing with it. Defoe got the wrong side of Dann, who made the tackle and pushed the ball past his own keeper. Don’t start trying to be clever, Dann could not have made it any easier for Defoe. He should have done the easy thing - cleared the ball away when he had a chance. What an absolute gift for Sunderland! Shocking defending by Palace as first Yannick Bolasie gives the ball away, and Jermain Defoe races in to pounce on the loose ball. Scott Dann comes over to try and shield the ball, but then pokes an attempted clearance past his own goalkeeper, leaving Defoe to race through and roll the ball into the empty net. Quote Message: Patrick van Aanholt has been brilliant tonight - his willingness to get forward, the way he has played defensively. He has been criticised a lot this season but he has been superb this evening. Patrick van Aanholt has been brilliant tonight - his willingness to get forward, the way he has played defensively. He has been criticised a lot this season but he has been superb this evening. Final change for Crystal Palace as Marouane Chamakh comes on for Connor Wickham. Moments later, Palace are almost caught out as Patrick van Aanholt fizzes a shot over the bar. Quote Message: Sunderland would take a goalless draw all day long. Palace have not looked like scoring, not all night long, not whatsoever. Sunderland would take a goalless draw all day long. Palace have not looked like scoring, not all night long, not whatsoever. Duncan Watmore, nicknamed 'the Ginger Messi' displays a bit of the Barcelona forward's trickery to wriggle into the area on the right and feed a pass to Jeremain Lens, whose low shot almost catches out Wayne Hennessey, but the Palace keeper just about manages to smother the ball. Quote Message: Palace boss Alan Pardew is looking very frustrated. For a team that prides itself on their set-piece delivery, it has been awful tonight. Sunderland's players are really working hard to help each other out. Palace boss Alan Pardew is looking very frustrated. For a team that prides itself on their set-piece delivery, it has been awful tonight. Sunderland's players are really working hard to help each other out. Yannick Bolasie has a go from the edge of the box as Palace come forward again, good power behind the shot but it is straight at Costel Pantilimon. Patrick Bamford zones in, hoping for a loose ball, but Pantilimon holds. Bakary Sako only came on at half time but he is heading off now, replaced by Patrick Bamford. Did he tweak something when taking the free-kick? He applauds the Palace fans as he walks towards the bench, but doesn't look to be limping. Free-kick and Sunderland break again, Wilfried Zaha winning a free-kick when Yann M'Vila sticks out a boot and takes him down on the edge of the Palace area. A yellow card for M'Vila, who then heads Bakary Sako's free-kick behind for a corner. Duncan Watmore leaves Joel Ward for dust on the left before darting towards goal. Scott Dann stands in his way and down goes Watmore. Free-kick 25 yards from goal and a yellow card for Dann. Yannick Bolasie's ball into the box runs through to Wilfried Zaha, whose cross is put behind for corner. Yet again, it is wasted by Crystal Palace, but they come forward again through Connor Wickham, who shoots over. The home side look to have stepped things up a bit now. A double change by Sam Allardyce as on comes striker Duncan Watmore and forward Jeremain Lens, with Seb Larsson and Steven Fletcher going off. The Black Cats looks to have gone with three up top. Allardyce fancies this. So close from Bakary Sako! The gangly forward breaks forward from the right and, as Sunderland defenders back off, decides to have a go at goal, sending a dipping effort just wide of the far post. Another yellow, this time for Jermain Defoe. The Sunderland striker isn't happy when he sees Scott Dann move a free-kick a couple of yards forward from where the foul was committed. He stands in front of the ball, preventing Dann from taking it, and referee Martin Atkinson trots over to book him as a result. Sunderland fans have been giving Yohan Cabaye, the former Newcastle player, a fair bit of stick tonight. ...Bakary Sako takes the free-kick but it is an absolute gift for Costel Pantilimon, floated in for the Sunderland keeper to calmly step off his line and claim. A real chance for Sunderland! They win a corner, which is sent into the area and Sebastian Coates rises to meet it, directing the ball down towards the far corner but Yohan Cabaye sticks out a boot to clear off the line. Close. Crystal Palace are quick out of the blocks as Bakary Sako gets his first touch of the ball, whipping in a powerful cross. Sunderland's three central defenders are wise to it, though, closing in on the ball and clearing before any lurking Palace player can pounce. Quote Message: Jason Puncheon didn't have one of his greatest games. Connor Wickham seemed isolated up front, so they needed more numbers up in attack. Jason Puncheon didn't have one of his greatest games. Connor Wickham seemed isolated up front, so they needed more numbers up in attack. The stats suggest the goals will come in the next 45 minutes. We shall see. A change for Crystal Palace for the second half. Forward Bakary Sako comes on for Jason Puncheon. He looks likely to move alongside Connor Wickham in attack. I hope you're not driving and reading at the same time. Speaking of votes, if you haven't already you can now vote for who you want to be named BBC African Footballer of the Year. Voting closes at 18:00 GMT on 30 November and you can either vote here or by sending an SMS from your phone to +44 7786 20 20 08. It's been a tricky match so far for his side, but here's something for Alan Pardew to cheer about. He's won our vote asking who fans would want to be the next England boss - him or Sam Allardyce. Happy days. Quote Message: It's been scrappy at times, but there have been good periods especially from Sunderland on the counter-attack. At times Palace have used two or three people to do the attacking. The game has been really slow. You can see why Palace are better suited away from home. It's been scrappy at times, but there have been good periods especially from Sunderland on the counter-attack. At times Palace have used two or three people to do the attacking. The game has been really slow. You can see why Palace are better suited away from home. And one of the teams playing tonight is involved in this tweet...and could end the day five points off the top. I said before kick-off that this was either going to be 0-0, or a bit of a goal fest. At the moment, the former is definitely looking the most likely. There's been chances, but half-chances at best. Still, so far so good for Sunderland. Quote Message: An awful first touch by Patrick van Aanholt. Had he taken it he could have stabbed it towards goal. An awful first touch by Patrick van Aanholt. Had he taken it he could have stabbed it towards goal. Two minutes of added time goes up on the board as the fans at Selhurst Park are treated to another shocking miss. This time, Lee Cattermole sprays the ball out to Patrick van Aanholt, putting him clear on goal but he gets his touch all wrong and has to settle for a corner. Good skill from Wilfried Zaha on the right, bamboozling Patrick van Aanholt with his footwork before crossing into the area. Sunderland head away but the ball eventually falls to Yohan Cabaye, lurking on the edge of the box. He toe pokes well, well wide, though. A shocking effort and he knows it, holding his head in his hands. Speaking of set-pieces Palace have another corner, which Yohan Cabaye swings in high and to the edge of the area, the ball is hooked back in but Sunderland clear. Poor. Crystal Palace have been strong from set-pieces this season, but not in this match. I've counted three corners they've had and at least one free-kick in a dangerous position and they've failed to do anything from any of them. Oohs and ahhs as a bit of pinball plays out in the Sunderland area. Yannick Bolasie hooks a ball across the face of goal for Wilfried Zaha, who races in at the far post and heads back across to Bolasie, who then shoots wide. The offside flag is up anyway for Zaha. Massive cheer, the biggest of the night so far in fact, as Palace keeper Wayne Hennessey belts a clearance up, over the roof and out of the stadium. Quote Message: That was much better from Palace. Their midfield three have been second best. That was the first time James McArthur picked the ball up and drove forward. That was much better from Palace. Their midfield three have been second best. That was the first time James McArthur picked the ball up and drove forward. That's better from Crystal Palace! James McArthur spots a bit of space in Sunderland's defence and drives forward, fizzing a shot at goal but Costel Pantilimon clutches the ball above his head. The fact that Jonathan Pearce and Steve Claridge are currently discussing each other's health tells you all you need to know about the action on the pitch at the moment. None-existent, but Sunderland will be happy with things at the moment. Sunderland have undoubtedly come the closest to scoring in this game - but they have also been mindful to defend in numbers, as this graphic illustrates. Seven players, very much in a line. ...Sebastian Larsson rolls the free-kick to the edge of the area for the unmarked Billy Jones but his shot is charged down and Crystal Palace survive. Penalty? Jermain Defoe tumbles just inside the area, the away end shouts for a spot kick, but replays show that the striker was fouled just outside the area. Quote Message: It's a good game. A lot of people coming here probably thought it would be one-way traffic. What we've seen so far, this is going to be a good game. It's a good game. A lot of people coming here probably thought it would be one-way traffic. What we've seen so far, this is going to be a good game. The graphic shows number six Lee Cattermole finding team-mate Jermain Defoe (18) with a pass. The ex-Tottenham striker was unable to provide the finishing touch a few minutes ago. Counter-attacking football is the order of the day for Sunderland, and it has been reasonably effective so far. Nasty. John O'Shea and Yannick Bolasie both go for the ball and end up clashing heads. Bolasie is made of strong stuff as he quickly shakes it off. O'Shea takes a little longer but is eventually up off the floor and good to go. It was a fairly heavy contact but both do seem OK.
First shot on target as Yannick Bolasie has a go from distance, low and hard but straight at Costel Pantilimon in the Sunderland goal. Sunderland look like Teenage Mutant Ninja Gooseberries. You've slightly lost me, but I sort of see what you mean. Yannick Bolasie sends a cross into the area for Connor Wickham, its headed away but only as far as Yohan Cabaye, lurking on the edge of the area. He can't get his shot off and Sunderland break quickly again, this time Lee Cattermole tearing open the defence with a ball for Jermain Defoe, but he can't get his shot on target. Good, open game so far! Pards or Big Sam for England? Alexander Greensmith: Pardew for longevity, Big Sam wants it but Sunderland will taint his career in my opinion. Though I feel it will be Southgate or Neville next after a QF finish at Euro 2016. Anthony Rothwell: Sam Allardyce. always done the that was needed doing. Pardew struggled at charlton and west ham. So id say big sam is of the more deserving. Connor Wickham, acting as a lone striker, will be desperate to bag a goal against his former side tonight. He's not seen much of the ball yet as Sunderland embark on their second attack of the game with a quick break ending with Patrick van Aanholt, curling a low shot wide just inside the area. It's only a joke! Big Sam is only pretending to bang his head here. Maybe feeling the restrictions not only in the dugout, but also the Premier League. Even if his side win tonight they won't climb out of the relegation zone. Yannick Bolasie shows off some fancy footwork just inside the Crystal Palace half, before his cross is deflected behind for a corner. Jason Puncheon takes it drilling the ball into the box, but it is poor and Sunderland clear. Quote Message: That was a great chance. Fletcher produces great technique to control the ball. It sits up nicely but he skies the shot horribly. That was a great chance. Fletcher produces great technique to control the ball. It sits up nicely but he skies the shot horribly. Sunderland's formation - with five at the back - suggests they are taking no chances tonight but it is the away side who has the first effort on goal, Jermain Defoe nodding a ball into the box down for Steven Fletcher, but he spoons a shot well over. The players from both teams link arms as the French national anthem "La Marseillaise" is played to remember the 130 people who died in the Paris attacks earlier this month. French midfielder Yohan Cabaye sings the words. A minute or so away from kick-off. First observation of the night - Sunderland's lime green kit is horrible. Right then, the players are out on what is a chilly night in London. The cold weather has not put the fans off, though, with Selhurst Park apparently sold out. Sunderland boss Sam Allardyce: "We've got goalscorers in Jermain Defoe and Steven Fletcher tonight. When you have a team you have just taken over you have to find various combinations. With John O'Shea at left back we will hopefully nullify Palace's strength on the wing." "Sunderland system can cause us problems"
Crystal Palace boss Alan Pardew: "Sunderland manager Sam Allardyce will play five at the back tonight and have a system that will cause us problems, although it didn't work for him against Everton. Connor Wickham is in attack tonight for us. He hasn't scored for us yet but his link-up play is massive." You can tell the nights are getting colder. Although many continental footballers appear to still wear gloves in mid-May these days, the mascots demonstrating gloves, thermals AND hats suggest we're in for a cold night at Selhurst Park. "If Crystal Palace's home form had matched their away successes, they would be in the top four. "Their performances at Selhurst Park haven't been justly rewarded but they should notch a home win in this one - especially if Yannick Bolasie repeats last season's Stadium of Light form, when his hat-trick destroyed Sunderland. "After their recent run of three defeats in league and cup, the Eagles bounced back to hold Manchester United and beat Liverpool. I can't see Sunderland containing them. "Big Sam Allardyce has had the international break working with most of his squad on team shape and discipline. But 18 goals conceded in six away games is relegation form." Forgotten how to win away? Sunderland won 3-1 at Crystal Palace in November last year. Since then, though, hardy Black Cats fans have not had much to cheer about following their team on the road. Just two away wins in almost a year, and none of those have come in this season. Big Al or Big Sam? Not easy, but if one of them was to succeed Roy Hodgson, who would you go for? Tweet #bbcfootball or text 81111. You can also use the BBC MOTD Facebook page. This game is a tough one to call. Could be a dull goalless draw, could be goals galore. Fancy a crack at predicting the outcome? Then have a go at the Premier League predictorhere. Crystal Palace have been excellent on the road - picking up four wins - but not so good at Selhurst Park, losing three games and winning just two. In fairness, they have had to entertain Arsenal, Manchester City and Manchester United, but Alan Pardew is still expecting a tough game tonight. "I never fancy my chances against a Sam Allardyce team," he said. "I know they have what they are trying to achieve in place and he has a team that knows how to play Premier League games - he's going to go and try and win the game." Fancy some pre-match raving? South London is clearly the place to be tonight. Get involved via #bbcfootball, text in on 81111 (UK only) and have your say on the Match of the Day Facebook page. Crystal Palaceforward Marouane Chamakh is on the bench having recovered from a hamstring problem. Connor Wickham is up front and replaces Bakary Sako in the starting XI. Sunderland defender John O'Shea returns to the starting line-up having missed the last two games with a groin problem. Midfielder Lee Cattermole also takes his place in the XI having recovered from injury. 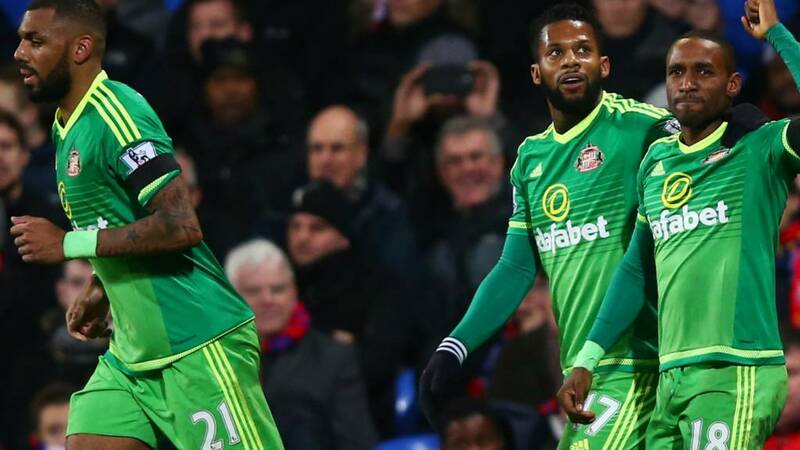 Patrick van Aanholt, Jermain Defoe and Seb Larsson also return to the starting line-up. If the FA had PowerPoint facilities back in 2006, Big Sam could have been England manager ages ago. On the shortlist to succeed Sven Goran Eriksson just over a decade ago, Allardyce put together "a real knock-your-socks-off" PowerPoint presentation for his interview. "There was nothing missing. Nobody but nobody was going to beat it," he said in his recent autobiography. "But then Brian Barwick, the chief executive, told me there were no PowerPoint facilities at the interview venue, so I had to print off hard copies for the panel. If one was chosen to become the next England boss, who would you go for? Why not Arsene Wenger for next ENGLAND manager. Unlike previous foreign managers he's worked here and knows the EPL and the players plus he gives young players a great framework to showcase their skills. Life is pretty good for Alan Pardew at the moment. Once hounded by sections of the Newcastle United fans, the 54-year-old's transformation of Crystal Palace's fortunes has seen his stock rise so much that he has even been talked up as the next England manager in recent weeks. Of the five English managers in the Premier League, Pardew is the highest placed, with Crystal Palace currently 10th. The lowest? Sunderland boss Sam Allardyce in 19th. Allardyce is a little over a month into his time at the Black Cats, but the pressure will be on him to start turning things around sooner rather than later. Pop 5 live on now for a bit of The Monday Night Club. Mark Chapman presents football discussion and build-up to Crystal Palace v Sunderland, with commentary on the game from 20:00. Right, the news conference is winding down so time to switch our attention from Madrid to London for the big one - Crystal Palace versus Sunderland. If there are any other big lines to come from Perez I'll be sure to drop them in here. Florentino Perez has also batted away rumours that Carlo Ancelotti was being lined up for a sensational return in the summer, although did say "you never know what happens in six months". Florentino Perez is still speaking, taking questions from the floor now. He says he understands fans' frustrations at Saturday's defeat, but asks for their support. Florentino Perez adds that Rafael Benitez as "the chosen one" to bring success to the club. Benitez the right man for Real? Florentino Perez has no shortage confidence in Rafa Benitez to bring success to Real Madrid. "We have complete faith and confidence in Rafa," says Perez. As expected, Benitez is staying then. Florentino Perez takes his place at the front of the gathered media and starts talking in Spanish. Tweet us using #bbcfootball, text 81111 or use the BBC MOTD Facebook page. Real Madrid president Florentino Perez calls a news conference just days after Tim Sherwood is reported to have been offered a job at a top-flight Spanish side. Yes, yes it is coincidence. "An article in Monday's Marca newspaper claims the Real squad has lost all faith in Rafael Benitez. "Another report says players have taken to privately mocking their manager over his modest playing career and supposedly incomprehensible tactical instructions. "They refer to him as 'number 10' - traditionally the intelligent playmaker who can read the game and see the spaces, things they do not think Benitez can do." Read more from Andy West on Rafael Benitez here. What's gone wrong for Rafa? Back to why exactly Rafael Benitez is under a bit of pressure. Just 12 games into the season and the Spanish giants are already six points behind leaders Barcelona, who humiliated them in El Clasico on Saturday. Men against boys was how Chris Waddle described it on BBC Radio 5 live that night, and you can't argue with that. They were utterly outclassed. Cristiano Ronaldo was largely anonymous, and cut a frustrated figure throughout. He's been linked with a return to Manchester United over the weekend. Does the Portuguese forward want out? Tonight's Premier League clash does, however, put together two managers who have ambitions to one day be in charge of England. "I believe I should be in the running whenever it comes round again," said Allardyce in his recent autobiography, serialised in the Sun last month. "I’m ambitious and I still want the England job." Who do you reckon would be the best man for the job and why? Let us know via #bbcfootball, text in on 81111 (UK only) and have your say on the Match of the Day Facebook page. We are also running a vote on this page asking who would be better - Big Sam or Pards? The vote is open now and runs until 20:45 GMT. Check terms and conditions here. This Real Madrid news conference is not the only reason we're here tonight, with Crystal Palace taking on Sunderland in the Premier League at 20:00 GMT. It's Alan Pardew versus Sam Allardyce. A game between one team that has won just two games at home all season and another that is still searching for its first away win. A news conference called out of the blue would suggest that some sort of drastic action has been taken, but reports in Spain suggest otherwise. Marca suggests that Florentino Perez will speak in support of Benitez and "may even give the coach free rein to take any drastic measures that he sees fit." We'll find out soon enough, with the news conference set to get under way in about 15 minutes. Just five months after becoming Real Madrid boss, the pressure appears to be mounting on Rafael Benitez. A 4-0 hammering at home to fierce rivals Barcelona in Saturday's El Clasico led to boos from Real fans, and a news conference with president Florentino Perez was called earlier today for 18:30 GMT tonight. Is the axe about to fall on Benitez? Or will Perez give him is backing?